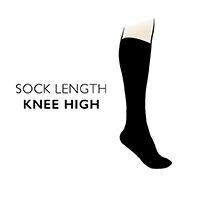 A soft, smooth and skin-friendly essential for your sock collection, our single colour Sockshop Plain Bamboo Knee High Socks will treat your legs to the natural warmth, moisture absorbency, breathability and odour resistance of this clever fibre. Silky bamboo-based fabric is antibacterial and gentle to every type of skin, with long, rounded fibres that won't irritate — especially when combined with our hand linked toes for smooth seams. The knee high tops feature our Comfort Cuff welts, holding without tightness or leaving ugly marks behind.